Hoo ya! I gotta tell ya, I’m a little fired up today. Nothing gets my dander up like seeing NFL players – players *I* traded 6 barrels of bathtub hooch to a Spaniard for – taking a knee and disrespecting the flag of my country. Show some respect, boys. The flag ain’t a goddamned woman. Now, I put up with a lot in my position as the proud owner of dozens of fine young black bucks. I don’t mind a little horseplay, like throwing your girlfriend on top of a pile of guns, or a little funsies after hours, like smashing a stripper’s head into the stage. After all, nobody got hurt in those instances, save a couple of women. But when you disrespect some cloth and a song, brother…what kind of monster are you? After all, by exercising your First Amendment rights, you’re disrespecting the men and women who fought and died for the right for you to exercise your First Amendment rights. You follow me? Look, I get it – black folks and the police don’t get along. Trust me, I get it! 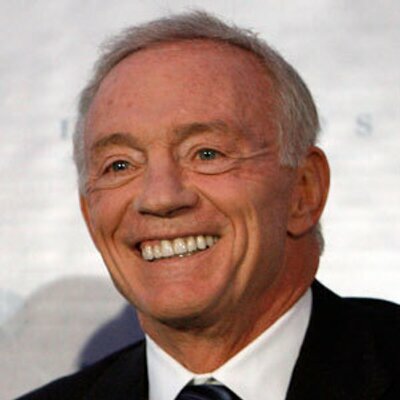 I’m the guy that signed Michael Irvin and Alonzo Spellman and Ezekiel Elliott and Sam Hurd and Josh Brent and Dez Bryant and Jourdan Lewis and Damien Wilson and Nate Newton and Joseph Randle and Erik Williams and Quincy Carter and Antonio Bryant and Dwayne Goodrich and Sherman Williams and Charles Haley and C.J. Spillman, ok? Hell, even ol’ Double J has had his moments. So listen, because I’m only gonna say this once: the only time I want to see any of MY players take a knee is when they’ve been ordered to do so by law enforcement officials. After all, if black players don’t do exactly what those cops say, they’ll shoot the hell outta them, and then how will I get my signing bonuses back? Look at it this way, fellas: what has the flag ever done to you? Did it ever mouth off? Did it tell you no? Did it try to get you to pay child support? No, it didn’t, and so it doesn’t deserve this kind of treatment. Keep the disrespect where it belongs, men: for the women in your lives. Thank you, and God bless America.